I never miss an opportunity to glance into shop windows as I often find my most cherished pieces by accident. 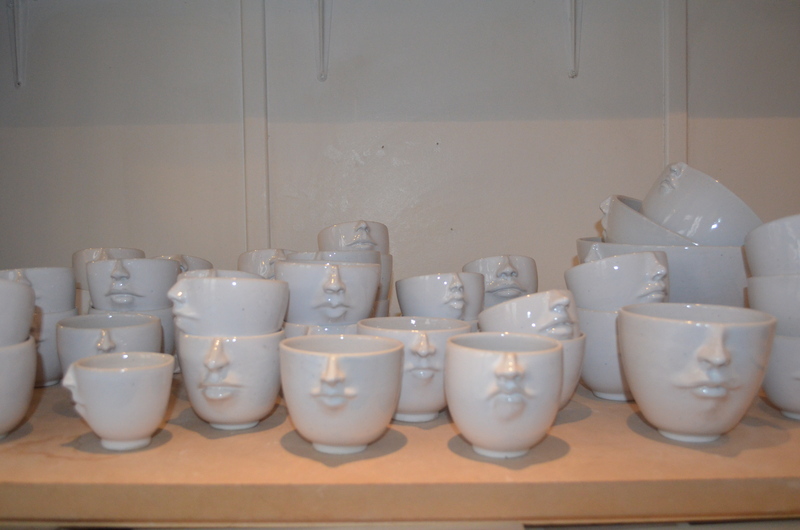 My hunger was put on hold when I discovered on rue Audran a small shop window filled with one-of-a-kind cafe’ size cups…each with its unique nose and lips. The young woman artist and creator, Alice Lothon, was still inside working at her pottery wheel where she creates each piece one at a time. I loved all of her pieces…cafe’ size cups, cafe’ au lait bowls, and even large table-top size pieces. She could see my enthusiasm and between my not-so-good French and her not-so-good English, I learned the story of how she came to create her vision. The next year, I brought my 12-year-old granddaughter to Paris and took her to Alice’s shop. Alice remembered me AND my enthusiasm and she treated my granddaughter like family. What a great surprise, our connection a year earlier led to Alice taking my granddaughter under her wing. Sitting side-by-side around the small pottery wheel, Alice taught her how to make her own unique cafe’ cup. More importantly, Alice showed her the soul of people we meet in travel. Many people would just pop into Alice’s shop and buy some cups to take home. My granddaughter and I took home life-long memories! This entry was posted in MEETING LOCALS, OFF THE BEATEN PATH, PARIS and tagged Art, Off the beaten path, Paris on February 25, 2015 by passportandcuriosity. Loved this post. Looks like you had so much fun. Fascinating photo of the fine painting work on the cup with a face! My granddaughter was with me for 4 weeks in France and returned home with a new insight into the kindness of people around the world. Thank you Jeanene, One of my clients, a Chicago designer, purchased 12 of the cafe’ cups. They are very creative and unique! I will be in Paris in April and will stop by Alice’s studio for your information. Yes, we are really all the same. Narrow Street in Florence Leads to Amazing Leather Artisan! Christmas ornament made with 3 D printer by my 10 year old granddaughter ! Italian wedding dress shows off bride's legs! Chalk sidewalk art in Rome brings beauty everywhere. Presentation makes everything catch your eye at street market in Paris.